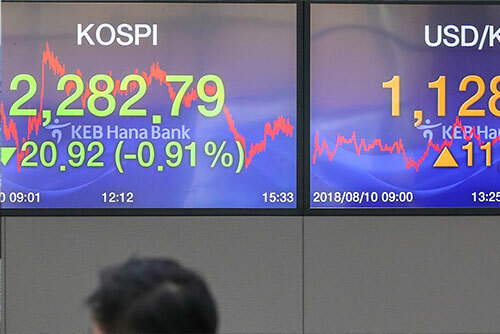 South Korean stocks fell on Friday as investors assessed the impact of the latest back and forth in the ongoing trade war between the U.S. and China. The benchmark Korea Composite Stock Price Index(KOPSI) ended the day point-91 percent lower after losing 20-point-92 points. It closed the day at two-thousand-282-point-79. The tech-heavy KOSDAQ also fell, losing four-point-67 points, or point-59 percent, to close the day at 784-point-81. On the foreign exchange, the local currency weakened eleven-point-seven won against the dollar, ending the session at one-thousand-128-point-nine won.